Michael O’Leary bought TWO drinks for everyone on flight FR449 after Tiger Roll won the 2019 Aintree Grand National, following criticism of his decision just to buy one drink last year. Watch here. Aircraft stack up in Renton as the Boeing 737 MAX groundings show no sign of lifting. Watch here. Dr David Dao, who was forcibly removed from a United Airlines flight, has broken his silence on the 2017 incident. Watch the ABC News interview here. Guillaume Faury talks about his first day as Airbus CEO. Watch here. Qantas celebrates a year of non-stop flights between Perth and London – with more than 450,000 meals served. Watch here. As the final season of the show approaches, Tourism Ireland showcases Game of Thrones locations in the North. Watch here. Tourism NI has a range of reasons why you need to visit Fermanagh. Watch here. Qatar Airways raises awareness about autism. Watch here. 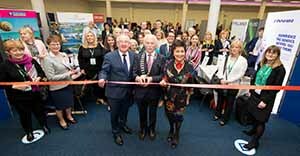 The ITAA’s Irish Travel Trade Show will double up in 2020 with an exhibition in Cork on Tuesday, April 1 and a new Dublin venue on Wednesday, April 2. Business Exhibitions says that the Dublin show will totally revamped as a result of consultation with exhibitors. Pat Dawson, CEO of the ITAA, said, “the Munster trade found it difficult to attend the Dublin show. 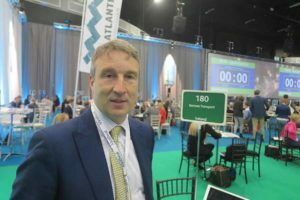 With this in mind, we have decided to bring the show to them to save time out of their busy day.” Watch here Travel Extra TV video diary of the Irish Travel Trade Show 2019 in the RDS. See more pictures here or connect with the album on Facebook. A widely reported Dublin Port briefing document for a meeting with Transport minister Shane Ross has been released which said that construction work to extend the North Wall Quay can bring cruise calls back to a projected 150 in 2024/25, and 200 the following year. But before the ropes are thrown, it is subject to third party financial support as has happened in other cruise ports such as Barcelona. The briefing came as waves created by the port’s proposal cut cruise ship calls to the city from 172 in 2019 to 80 in 2021 continue to wash world-wide and trouble stake holders in the home holiday industry (see below). All of this is as first stated by Travel Extra‘s Eoghan Corry on RTE radio (listen here), cruise calls generate €2m for the port, the extension will cost €120m, so who is going to fund it? The ever loquacious Michael O’Leary may soon have reason to expand on his critical comments on Donald Trump (watch here). In the current environment, it is hard to decide which reputation is in the steeper descent, Boeing or the US regulating agency FAA. No surprise, then, that US President Trump stepped in on Tuesday to bolster beleaguered Boeing, the USA’s largest exporter by value, by threatening sanctions on Airbus. Trade wars have become Trump’s preferred method of negotiation, and the obvious target as he picks this fight with the EU will be Boeing’s 737 Max production line, when (if?) it resumes. Boeing does not have many customers of scale in Europe, but most of them are in Ireland. Michael O’Leary has 135 on order (200 counting options), while Gus Kelly of Aercap has ordered 100, Dómhnal Slattery of Avolon 95 and Alec Burger and Diarmuid Hogan of GECAS 176. Worrying times, then, in Shannon and Swords. At Aqua Libera Rural Hotel in Aljucen in rural Extremadura visitors can dress like a Roman and eat food prepared according to imperial menus handed down by classical writers. A group of six Irish travel media sampled the experience as part of a visit to Extremadura this week, hosted by Yadira Chaparro of Extremadura Tourism and Sara Rivero of the Spanish Tourist Board. They visited Zafra, Mérida, los Barruecos Natural Monument, Cáceres, Herreruela and Trujillo. Pictures shows Tony Baillie of the Irish News, Eoghan Corry, editor of Travel Extra, John Donlon of the Sunday World, Sorcha O’Connor of the Irish Independent, Anne Hattaway of the Sunday Independent, Gillian Tsoi of The Herald, front: Yadira Chaparro of Extremadura Tourism and Sara Rivero of the Spanish Tourist Board in Dublin. Watch here video diary of the visit to Extremadura. See more pictures here or connect with the album on Facebook. Incoming chair Ruth Andrews told the ITIC AGM she welcomed significant investment in new tourism products including 5,000 hotel bedrooms under construction in Dublin but said it was “time that the Government matched the industry’s ambitions which estimate potential growth of 65% with 80,000 further jobs over the next seven years. 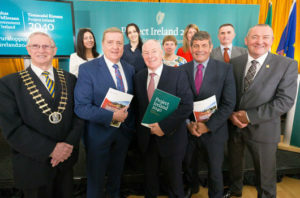 The extra investment in Budget 2019 only brought tourism budgets back to 2008 levels – that’s been a long decade of under-investment”. ” Eoghan O’Mara Walsh urged the speedy lifting of two of the planning restrictions for the parallel runway at Dublin Airport. 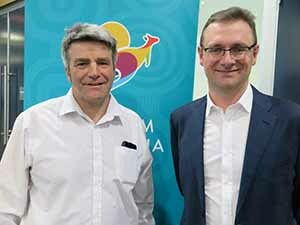 DAA’s Cormac O’Connell becomes Deputy Chair. Full story here. 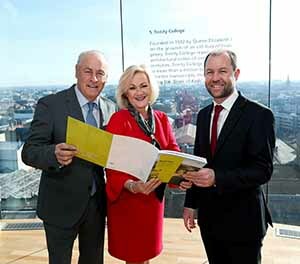 Picture whose Maurice Pratt, Ruth Andrews and Eoghan O’Mara Walsh. Jet Airways, until 2012 the largest carrier by passenger market share, suspended all international flights and all Eastern India bound routes due to a lack of available aircraft until Monday, when it plans to meet lenders to try to secure funding. It follows a week when Shannon-based Avolon applied to the Directorate General of Civil Aviation for de-registration of their B737 VT-JGP, which means that the lessors can take their aircraft out of country and lease them to other players, and seizure occurred of an aircraft at Amsterdam by a European cargo services provider. Jet Airways is saddled with $1bn of debt and employees have not been paid for three months. Local reports suggest just a dozen of its fleet of 119 aircraft are still flying. The airline has 13 aircraft leased from Boc, 10 from Gecas, three from Dae, two from Aercap and one each from Avolon and Fly. The airline flies on 600 domestic and 380 international routes, but carriers in India must maintain a fleet of 20 aircraft to continue to operate international services. 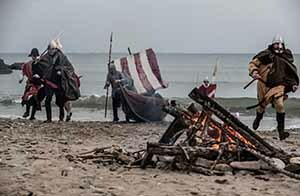 Bannow in Co Wexford launched a year-long programme of public events to mark the May 2019 850th anniversary of the arrival of the Normans to Ireland with historical talks and demonstrations, music concerts, landing re-enactments, workshops, medieval games and a Viking Fire Festival with a Norman twist in New Ross, Wexford town, Ferns and Enniscorthy under the banner ‘The Normans Are Here.’ Bannow 1169 Norman Festival on May 4th and 5th will feature battle reenactments, historical lectures with Turtle Bunbury and Emmet Stafford, a commemorative ceremony and concerts featuring local and French musicians, a medieval living history tented village with 14 living history tents, 15 living heritage craft displays, and a display of Norman cavalry warfare and fully trained warriors. An inaugural performance of a specially commissioned piece of music for the occasion by composer Greg French will be performed by the Danescastle School senior band and guests. WTC Selective Travel from Belfast will represent Ireland when travel trade from 110 countries gather for the Turkish Airlines world bowling championship for the travel trade, with 889 points the best of 28 teams. 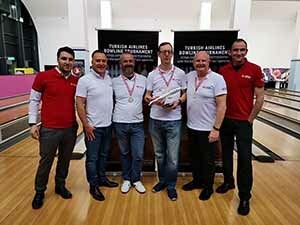 Picture shows Onur Basak Turkish Airlines Sales Manager, Onur Gul, Aaron Bolt, Michael Holmes and Peter Osborough of WTC and Stephen George Fry, Turkish Airlines Operations Manager. The Dublin leg was own by Travel Counsellors (Brenda Murray-Flynn, Audrey Murray and Dymphna Quilligan) and the Cork leg by Lee Travel (Lydia Madigan, Josephine O’ Keeffe and Mary Jones. Accommodation and Gala Night programme will be at Renaissance Polat Istanbul Hotel between 18th to 21st of April 19. See more pictures here or connect with the album on Facebook. Congratulations to Onur Gül who won the award for Best Business Partner for Turkish Airlines at the Travel Counsellors’ annual national conference, (tagline TCX – Travel Counsellors Experience) at the 5-star Powerscourt Hotel, Back row: Ian Flynn, Celia Alvarez of Rentalcars.com, Onur Gul, Shaun Lyons of Celebrity Cruises, Bernie Whelan, front row, Fidelma Brady and Brenda Murray Flynn. It was a busy and enthusiastic two days of networking for the 74 travel counsellors and 55 suppliers. The Black Tie Awards took place on the Friday night with pre-awards drinks sponsored by Blue Insurance. Travel Counsellors General Manager Cathy Burke told Travel Extra that cruising is up 44pc and overall business up 12pc in 2018, “The corporate side of the business is steadily increasing as is the average spend per booking, while soft adventure holidays in destinations such as Japan and Vietnam are increasingly popular with holidaymakers. For the first time Japan is in the Top 10 of holiday destinations. 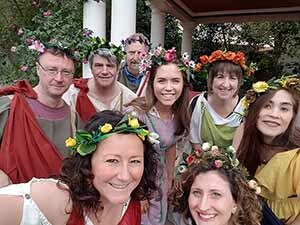 What we are finding is that while our customers will take maybe two “fly and flop” trips of around four days each they’ll keep the bulk of their holidays for a longer and more adventurous break”. 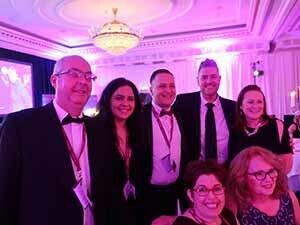 Travel Counsellors, which held its first conference for its 20 homeworkers in Dunboyne Castle 12 years ago, now has 74 and continues to grow. Cathy puts its increasing appeal down to the company’s ethos of positivity and success. “When I entered the holiday business it was known for being very badly paid – but that’s certainly not the case with Travel Counsellors. All our TC’s know that the sky is the limit and there is a very strong support system in place for them every step of the way. I know I say it every year but it’s true – we are like family“. Keynote speaker, Disability rights advocate Sinéad Burke spoke about her career journey to date, from Ted Talks to the fashion industry along with outlining to attendees the need for more accessible travel. Other speakers included Steve Byrne, CEO at Travel Counsellors on the vision of the leading travel company, while Waseem Haq, Digital and Innovation Director spoke about new marketing and digital developments. Jim Eastwood, Director of Sales outlined the importance of DMCs to enhance the customer experience; Michael Vincent, Head of Talent and Learning presented on the tools available to build Travel Counsellors’ personal and business development; and Richard Thompson, accessible travel expert, spoke about the commercial side of accessible travel. Watch here full interview with Cathy Burke. See more pictures here or connect with the album on Facebook. 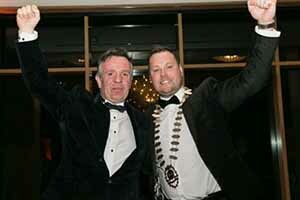 Picture shows newly elected President of Skål Dublin Bob Linnane with Tim O’Brien, general manager of the National Yacht Club, Dun Laoghaire, who hosted colleagues at the April 9th Skål event. Incoming president is Bob Linnane (email), secretary Noel Carroll (email) and Treasurer Margaret Cronin (email). Skål Dublin’s 2019 calendar is: May 14th. Camden Court Hotel June 11th. Ashling Hotel July 9th. BBQ @ Radisson Blu Hotel, Stillorgan. (6pm) September 10th. Cassidy’s Hotel, Parnell Sq. October 8th. Herbert Park Hotel November 12th. Guinness Storehouse, December 10th. President’s Lunch, Fitzpatrick’s Castle Hotel Meet 12.00 Noon. TAP Air Portugal, the country’s Ambassador to Ireland and the Portuguese Tourist Board celebrated the launch on March 31 of the airline’s new double-daily service between Dublin and Lisbon. 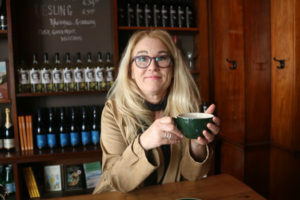 Representative Aileen Eglington of AE Consulting said the new service will provide easy onward connections to holiday destinations in both the Azores and Madeira, as well as long-haul destinations in Africa and South America, with a free stopover allowed in the Portuguese capital too. 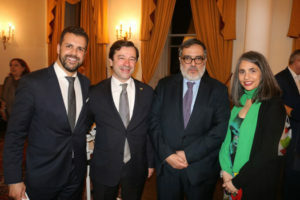 TAP’s Ricardos Dinis and André Serpa Soares are pictured with Portuguese Ambassador Miguel de Almeida e Sousa and Susana Cardoso, Director Ireland, Portuguese National Tourist Office, at the press dinner to celebrate the service’s launch at The Stephen’s Green Hibernian Club. Paul Nolan represents TAP in Ireland through APG. See more pictures here or connect to the album on Facebook. Visit USA is to revamp its visitusa.ie website to make it more accessible to the consumer market, as well as its traditional site visitors from the trade and media, said Chairperson Claire Doherty. She and Tony Lane hosted partners from Delta Air Lines, Visit Kansas/Oklahoma, Visit Utah, Hertz and Bradley International Airport at Dublin’s Clarence Hotel. Full story here. 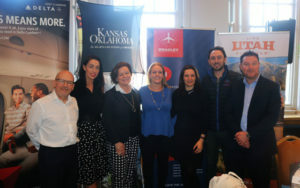 Matt Bates, Kansas/Oklahoma Travel & Tourism; Emma McHale, Hertz; Teresa Murphy, Delta; Claire Doherty, Visit USA; Jenny Bridgman, Visit Utah; Charlie McNally, Bradley International Airport; and Tony Lane, Visit USA are pictured at the event. See more pictures here or connect to the album on Facebook. In a busy week for US tourism, Katha Spitz, the new International Markets Manager for the Las Vegas CVB, made her first visit to Ireland to meet agents. She’ll be highlighting the ever-changing face of the city, which has been upping its game in the sports arena, and now boasts a full complement of top-level US sports teams. Full story here. She’s pictured with Tryphavana Cross, Las Vegas CVB, at the Shelbourne Hotel in Dublin. Bookings that include China with Wendy Wu between April 1 and May 31 will be entered into a competition or a 5-6 day trip to Chongqing in June 2019, with 10 places being given to the top-selling agents during the two-month period, and the other five places being allocated by a draw of all agents who have made at least one booking. Agents get an opportunity to visit UNESCO World Heritage Sites and experience how easy it is to travel through Chongqing with visa-on-arrival instead of getting a visa before travel. 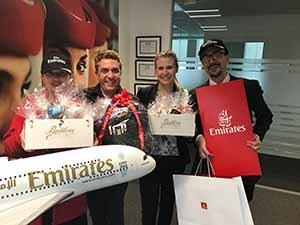 Emirates were visiting agents this week as part of their Easter Sales Blitz with chocolates from on-board partners Butlers. Wallace Travel Group is looking to hire an experienced retail travel consultant with a minimum of one to two years’ experience, with GDS knowledge and/or sun holiday sales experience. CV in confidence to Managing Director, Derek Wallace at derek@wtg.ie for immediate start. 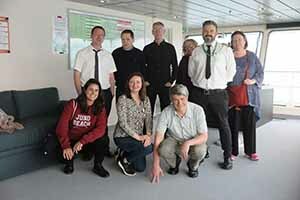 Irish Ferries and Normandy Tourism showcased the WB Yeats route to Cherbourg and the attractions of the hinterland of the port to a group of key travel media this week. They sampled the new ship’s faster 26 knot sailing to France direct from Dublin port, with fine dining in the Lady Gregory restaurant and relaxation time in the club class lounge, (see pictures here or connect with the album on Facebook). In Normandy they visited Granville, Mont St Michel, Bayeux Tapestry museum, Arromanches D Day memorials and museums, stayed at La Chenevière, rated by Conde Nast as the best hotel in France outside of Paris, tasted cider and calvados at Ferme de la Sapiniere and visited Cite de la Mer in Cherbourg. Picture shows bridge visit on board Irish Ferries WB Yeats, David Gray of Michael Gray coaches, Stephen Moore of the Sunday World, Martin Burns of the Irish Sun, Martine McKenna of Irish Ferries, Simon Maple Captain of Irish Ferries WB Yeats, Ailish O’Hora of the Irish Independent, Front row: Fran Lambert of Normandy Tourism, Anne Sheridan of the Irish Mail and Eoghan Corry editor of Travel Extra. Watch here the trip from Dublin Port to Cherbourg on irish Ferries new cruise ferry WB Yeats. Watch here video diary of the trip to Normandy with Irish Ferries. See more pictures here or connect with the album on Facebook. 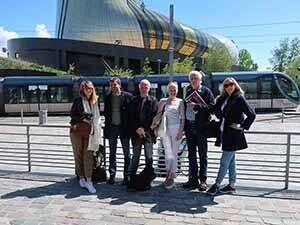 Bordeaux tourism hosted key Irish travel writers to publicise the airline’s direct flights to Bordeaux. Picture shows the group outside one of Bordeaux’s newest and most popular attraction, the €81m Le Cite du Vin, which is housed over 8 floors and pays homage to the region’s world renowned reputation for superior wines. Karolina Walczowska of Onet Podroze, Yann Delomez of Ryanair, Mark Kavanagh of the Star, Aileen C. O’Reilly of Travel Extra, George Keegan of Northern Ireland Travel News and Emma Pietras of the Sun. See more pictures here or connect with the album on Facebook. The next Australian Tourism Exchange will be hosted by Melbourne Convention and Exhibition Centre on May 10-14 2020. Brodie Carr and John O’Sullivan (pictured with Eoghan Corry) hosted 600 international and domestic buyers, 70 media from 30 countries and 1,400 sellers from 550 companies at ATE, one of three major travel trade events to be hosted by Perth in 2019. ATE was first held in Perth in 2005, and again in 2008 and 2012. Bearded bandamanan Jim Murty has departed the irish mail, five years after building the travel section up from two pages at the back to six pages at the centre of the Saturday edition. He intends setting up a blog, Jim Murty’s TravelTravelTravel. Spilling drinks by accident on a passenger is bad enough – but pity the American Airlines flight attendant who dropped a drink on company CEO Doug Parker, after a passenger bumped into her. Luckily Parker saw the funny side of it, and posed for a picture with Maddie Peters. Holidaymakers are being moved from Phuket’s famed Mai Khao beach because the taking of selfies may endanger incoming aircraft about to land on Phuket International Airport’s Runway 9, under a law that calls for the death penalty for the most extreme offences. A Lithuanian man flying to Italy got a pleasant surprise when he found he was the only passenger on the Boeing 737-800. A power outage on a British Airways flight from Singapore to London caused all the TV screens and lighting to switch off and the oxygen masks to drop down. Keynote speaker at the WTTC summit in Seville was Barack Obama, former President of the USA, who discussed his view on the travel and tourism sector and its importance to cultural awareness and the global economy. See interview with Obama advisor Helen Marino here. Tianguis Turístico 2020 will be held in Mérida, Yucatán. 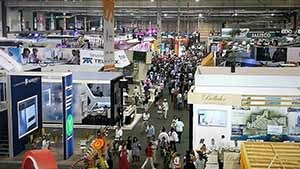 Mexico’s tourism minister Miguel Torruco Marqués said the 2019 event in Acapulco this week attracted 1,249 buyers from 45 countries for 47,114 appointment, up 5.3pc. Sri Lanka will offer a six-month free visa period from 1 May to more than 30 countries. Faroe Islands will close its shores to tourists for a weekend to honour the Earth Day celebration, which takes place during the last week of April. Greater Fort Lauderdale Convention and Visitors Bureau appointed Tracy Vaughan, an old friend of Travel Extra, as the new Senior Vice President of Tourism and Travel Industry Sales effective April 22, responsible for the strategic leadership of the bureau’s domestic and international transient sales efforts. The new King Richard III Visitor Centre was among 76 attractions including museums, galleries, farm attractions, and churches were recognised in the VisitEngland Attractions Accolades for 2018. Kim Endicott of Costa Mesa, California and her Ugandan driver were both safe after being abducted in Uganda and brought to the DR Congo. VisitScotland celebrated its 50th anniversary and the 40th edition of VisitScotland Expo at the Scottish Event Campus in Glasgow with 340 businesses meeting 550 buyers from 28 countries. Sunway selected its best beaches list for 2019: Praia de Alvor, Praia do Camilo, Portimao, Makronissos Beach, Ayia Napa, Torrevigía Beach, Benalmádena, Bitez, The Bodrum Peninsula, Turkey. 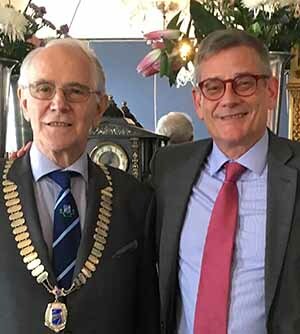 The Restaurants Association of Ireland appointed Mark McGowan of McGowans of Phibsboro and Scholars Townhouse Hotel of Drogheda as its new president. CEO Adrian Cummins called at the Restaurants Assocation AGM for the establishment of a multi-agency forum to address the skills shortage currently being faced by the Irish hospitality sector at the RAI AGM. Plus ca change, the grand opening of Dave Mulligan’s new cocktail outlet Bar 1661 on Green Street of Dublin will take place on Good Friday. Mulligan previously opened Shebeen, and launched Bán Poitín whiskey in 2013. JP McMahon and Drigín Gaffey’s Tartare Café + Wine Bar will host a local artist or designer to discuss their work, their inspirations, and what it means to be an artist in Galway on the first Wednesday of each month from 7:00pm to 8:00pm, starting May 1 with Peter Bradley of Grey + Ginger Clothing, with confirmations for future dates from director of Macnas, Noeline Kavanagh; artist & lightworker Finbar McHugh aka Finbar247; photographer Anita Murphy and stylist Zania Koppe of Ginger and Sage Photography; Elena Santos of Just Art It; Sandra Lovern of Lovern Leather Goods; and artist and curator of TULCA Festival of Visual Arts, Kerry Guinan. A report by Drinks Industry Group of Ireland on alcohol market share: beer 45.2pc (volume is up 2.7pc), wine 26.7pc, spirits 20.5pc and cider 7.5pc. The Food Safety monthly report itemised the temporary closure of six business included Taka Ra on Dublin’s Abbey Street for five days because of “substantial evidence that rats are active in the rear area”. Belfast’s derelict Rotterdam Bar and Pat’s Bar on Pilot Street are to be demolished. Adare Manor hosted a collaboration evening with Wine House Bodegas Torres in the Carriage House Restaurant in the grounds of the resort. Irish Executive Chef Gary Rogers is to lead the culinary team for the five star Conrad Dublin. Some thoughts on tipping in the Irish Times. Average Dublin hotel prices are down 1pc to €138 in April (down 7pc from March) according to Trivago’s monthly survey. An Bord Pleanála greenlit Johnny Ronan’s proposed 106-bedroom hotel on Dublin’s Tara Street, to take up four of the building’s 22 storeys. An Bord Pleanála greenlit Paddy McKillen Jr’s 52-bedroom hotel at the former Howl at the Moon venue on Dublin’s Lower Mount Street. 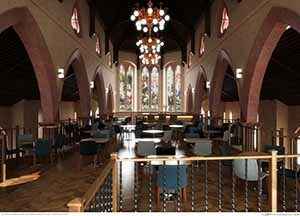 Belfast City Council greenlit Galgorm’s plans to develop an £8m 18-room hotel, restaurant and bar to open Spring 2020 on the site of the Holy Rosary Church and an adjacent Parochial House building at 348-350 Ormeau Road. Property group Marlet commenced work on a 239-room hotel and 256-room aparthotel on Upper Abbey Street in Dublin after An Bord Pleanála withdrew their appeal. Bullitt and Merchant hotel owners Beannchor, who are developing a £4m hotel on Lisburn Square in Belfast, reported revenue up 9pc to £25.8m and profit up to £11.2m due to due to a reversal of a previous impairment of fixed assets. Michael Magner and father-in-law Brian Scully acquired full ownership of the Vienna Woods Hotel in Glanmire having bought out partners the Fitzgerald family. Stanley Quek and Peng Loh from Singapore purchased Dublin Citi Hotel and Trinity Bar for an estimated €12m. Under pressure from US-based lawyers, Airbnb has changed plans to remove Jewish settler homes in the occupied West Bank from its rental listings. MarBella Hotels & Resorts, Corfu has rebranded as ‘MarBella Collection’. In another giant step towards becoming a fun service airline, Ryanair launched its connecting flights service at Brussels Charleroi, with 27 routes including Alicante, Budapest, Milan Bergamo and Prague, providing Ryanair customers with the opportunity to book and transfer directly onto connecting Ryanair flights, not including Ireland. Gus Kelly led AerCap reported that business transactions during the first quarter 2019 included signed financing transactions for $1.9bn, signed lease agreements for 43 aircraft, including 6 widebody aircraft and 37 narrowbody aircraft, purchase of 17 aircraft, including 12 Airbus A320neo Family aircraft, 1 Airbus A350, 3 Boeing 787-9s and 1 Embraer E2, sale of 21 aircraft, including 7 Airbus A320 Family aircraft, 2 Airbus A330s, 3 Airbus A340s, 6 Boeing 737NGs and 1 Boeing 767-300ER from AerCap’s owned portfolio and 2 Airbus A320 Family aircraft from AerCap’s managed portfolio. Ryanair brought forward to June 1 its planned cuts on the Belfast International to Stansted route from three times daily to three times weekly, citing operational reasons. They are similarly cutting Edinburgh to Stansted to four a week from four flights a day (fares on both routes had been extremely low as Brexit uncertainty impacts on average fares). LNER (railway) is offering 50pc discounts on rescue fares. 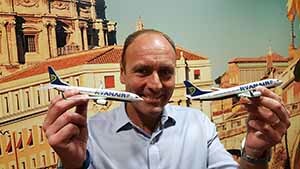 Ryanair launched 41 new routes for summer, 13 on sectors which are already flown by at least one other carrier, with the biggest competing airline being easyJet which is present on four services. Tetouan in Morocco joins the network. Air Canada has delayed the seasonal start of the Shannon-Toronto route until July 1, 2019. The following options are available: re-route through Dublin-Toronto, or Ei through Aer Lingus via Shannon-Heathrow or United Airlines via Shannon-Newark. All change fees and charges will be waived if origin, destination and cabin remain the same and if you re-book within 7 days of the original travel dates. Easyjet added two more weekly flights from Belfast International to Bristol on Tuesdays and Wednesdays. Easyjet winter schedule, released this week, will offer 13,000 seats from Belfast but no new routes. Data released by Sabre in Hannover, where 1,200 aviation professionals gathered this week to pitch for business at Routes Europe, showed Heathrow-Dublin retaining its third place among international passenger numbers ex Europe in 2018 with 1.81m behind Heathrow JFK with 2.92m and Heathrow-Dubai with 2.67m. Spain is the largest domestic market. 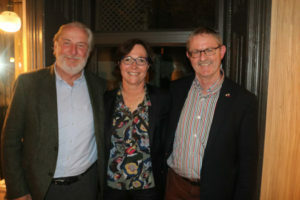 Bergen in Norway will host Routes Europe 2020. Picture shows Jasper Spruit of Norwegian airports operator Avinor, Stefan Schostok Mayor of Hannover and Steven Small, brand director of Routes. Spanish baggage handling unions Unión Sindical Obrera and Unión General de Trabajadores are threatening to strike Easter Saturday, April 20, 2019. United Airlines resumed flights between Shannon and Newark for summer daily until October 26. Picture shows Martina Coogan, Ireland manager of United. Emirates is holding cabin crew recruitment Open Days at the following locations, all of which commence at 9am, Sligo on Saturday 20th April at The Glasshouse Hotel; Saturday 20th April at Muckross Park, Killarney and Monday 22nd April at: Maldron Dublin Airport. Despite having no services since 2016, Waterford airport has not yet given up the fight and is lobbying for a runway extension. 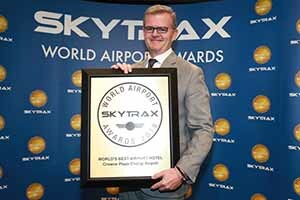 Bruno Cristol of Singapore Changi is picturing accepting the award for the best airport in the world in the always contentious Skytrax Awards for the seventh year in a row, ahead of 2 Tokyo Haneda, 3 Seoul Incheon, 4 Doha Hamad, 5 Hong Kong, 6 Centrair Nagoya, 7 Munich, 8 Heathrow (whose Terminal 2, used by Aer Lingus, won best airport terminal), 9 Tokyo Narita, and 10 Zurich. Dublin dropped from 80th to 84th place, Surprisingly, Amsterdam Schiphol dropped from 12th to 14th. US Senator Chuck Schumer called for Boeing to be removed from a Federal Aviation Administration rulemaking committee as investigations highlight the regulator’s role in two deadline airline crashes. Dublin Airport‘s new geographic information systems app has been introduced to its airfield operations team and will soon be available to Dublin airport fire and rescue service, used to track pavement assets, runways, taxiways and stands. Dublin was the first airport in the world to be re-certified under ISO Standard 55001. Picture shows Dublin Airport Airfield Facilities Manager David Toolan, Airfield Asset Care Business Support Deborah White and Spatial Data Manager Morgan Crumlish testing the new app on the airfield at Dublin Airport. 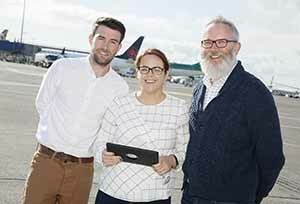 Aer Lingus launched its annual aircraft maintenance & engineering four-year apprentice programme with a particular emphasis on attracting female applicants. Full details here. Lufthansa lost its court challenge against state aid being granted to Frankfurt-Hahn airport to the benefit of rival Ryanair, having failed to prove the payments dented its revenue or market share. Air Nostrum expects EU authorisation for its merger with Cityjet by end September. Stobart Air retired the ATR72-500 aircraft from its fleet following the cessation of Flybe Isle of Man contract on March 31. Flybe brought the Isle of Man base in-house using its own DHC8-400 aircraft. Dublin Airport March passenger numbers were up 8pc to 2.5m with Britain up 7pc, continental Europe up 11pc, transatlantic up 11pc, other international down 8pc and connecting traffic up 34pc. Disagreement over price has caused a delay in sale of Aerfort na Minne by Padraig Ó Céidigh’s Aer Aran Islands to the Department of the Gaeltacht for Aran Islands flights. Chair of Sligo Airport Albert Higgins said the airport is struggling to meet the costs required for a 24-hour tower which is critical to operations of Rescue 118. “I understand the cost of the tower is approx €50k per year yet since the public service obligation funding ceased for the airport there is little to no income at the airport”. The Government appointed Brigadier General Seán Clancy, GOC Air Corps, as Deputy Chief of Staff (Support) of the Defence Forces and promoted him to Major General on assuming his appointment. Col Rory O’Connor, Chief of Air Staff Support, succeeds General Clancy as GOC Air Corps and Brigadier General. Avolon Holdings Funding was priced for a principal aggregate amount of US$2.5bn, upsized from an initial launch size of US$1.8bn, Moody’s upgraded Avolon’s corporate family and senior unsecured ratings to investment grade (Baa3). Fitch Ratings and S&P Global Ratings have also announced their intention to upgrade Avolon’s issuer and senior unsecured debt ratings to investment grade (both BBB-). American Airlines is extending by a month its cancellations of about 90 daily flights as the troubled 737 Max remains grounded by regulators. Virgin Atlantic reported its second consecutive year in the red with a loss of £38.9m for 2018 (compared to £65.5m in 2017) as the airline was hit by the Brexit-hit pound, economic uncertainty and engine woes. Virgin launched its new premium economy across all aircraft this week, with priority check in and boarding, free seat selection in advance, checked baggage and three inches extra legroom, as well as an economy light fare with no checked bag and allowance for one item weighing up to 10kg, and an additional handbag or small backpack not containing items that would otherwise be regarded as baggage. Troubled Flybe now provides 68pc of the seats offered at Belfast City Airport. There are reports that Flybe has been rigorously enforcing rules on carry-on luggage to extract more money from passengers. Loganair is planning service to east Midlands as part of its expansion at Derry. United is moving to a new pricing model November 15 in which it dynamically prices award seats, irking frequent flyers, but opening up a new tier of fares to budget travellers. Singapore Airlines has grounded two of its Boeing 787-10 aircraft due to engine issues, as “premature blade deterioration was found on some engines” of its 787-10 fleet at recent routine inspections. Qantas claimed that high airport fees and the Perth Airport’s legal case against the airline will kill plans to launch direct Perth to Paris flights as the airport sues Qantas in the Supreme Court, alleging the airline has underpaid it by 40pc for access to the airfield and terminal facilities. Brittany Ferries hopes to capitalise on Irish Ferries’ decision to drop Rosslare enticing holidaymakers in the south-east to travel to Cork rather than Dublin Port. That was message – along with a 16pc rise in bookings this year in the Irish market – as Ireland manager Hugh Bruton and executives from France and Spain hosted journalists in Dublin. Picture shows Manuel Pascual Uriarte, Director of Brittany Ferries in Santander; Joëlle Croc, Group Director of Sales and Customer Experience, Brittany Ferries; and Hugh Bruton, General Manager of Brittany Ferries Ireland. 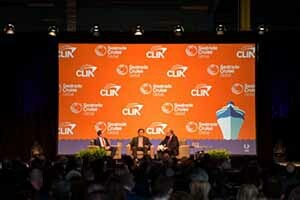 Global cruise passengers grew 7pc to 28.5m, supporting 1.1bn jobs worldwide and a total economic impact of $134bn, the Cruise Lines Industry Association reported at Seatrade, which returned to the Miami Beach Convention Center this year following a three-year run in Fort Lauderdale. Lines used the conference to explain product changes, ship expansions (Windstar), new partnerships (Carnival, which is partnering with Family Feud) and details about upcoming vessels (Seabourn expedition ship Venture). NCL’s Frank Del Rio told the CEO forum that “there is nothing I see that suggests any kind of slowdown is on the horizon.” The industry’s major lines will launch 18 new ships this year. Celebrity ordered a fifth Edge-class cruise ship from Chantiers de l’Atlantique in St Nazaire, scheduled for delivery autumn 2024. Within hours of some some breathing space on Brexit emerging from Brussels, Irish Ferries sold the Oscar Wilde to MSC Cruises’ parent company for €28.9m with delivery on April 19. Oscar Wilde, built in 1987, was acquired in 2007 and operated on the Rosslare-Cherbourg route. Uniworld’s latest Super Ship, the transformed SS Bon Voyage, set sail on her maiden voyage in France after an eight-month renovation in the small shipbuilding village of Druten in The Netherlands. AmaWaterways is to add a new 156-passenger ship to its European fleet on 1 July, 2020: AmaSiena, serving a variety of seven, 10 and 11-night itineraries along the Rhine, Main, Moselle and Danube rivers, and featuring connecting staterooms, increased personal space, luxury amenities, regionally-inspired cuisine in the Main Restaurant and the wine paired tasting menu in The Chef’s Table Restaurant. 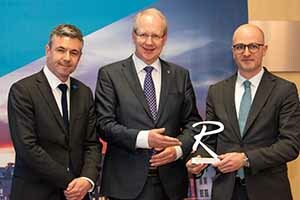 Royal Caribbean’s Richard Fain and Michael Bayley officially received Spectrum of the Seas from Meyer Werft Managing Partner Bernard Meyer at Bremerhaven. 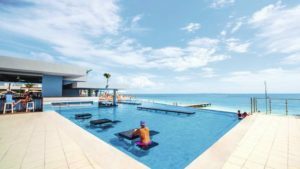 CMV have are to open a port in Puerto Penasco in Mexico and will offer six identical 11-night itineraries starting December 7, 2019. 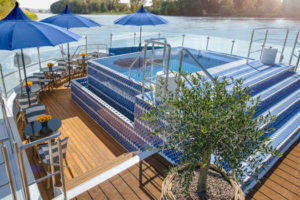 TUI has purchased three river cruise ships from Werner-Tours and Reiseburo Mittelthurgau Fluss and plans itineraries on the Danube, Rhine, Moselle and Main from summer 2020. Tauck’s new 84 passenger ms Andorinha will run family-friendly river cruise on the Douro from 2020. Silversea announced at Seatrade that Silver Origin will sail the Galapagos Islands from the summer of 2020. Silversea’s culinary programme Sea and Land Taste (SALT), will launch with new ship Silver Moon in August 2020. 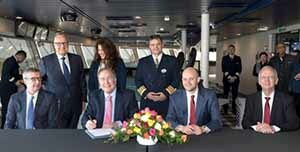 Avalon Waterways named its 13th Suite Ship in Budapest. Royal Caribbean suspended its SkyPad bungee trampoline shipboard pending a safety review after Casey Holladay fell to the deck in February fracturing his pelvis when ropes connected to the harness snapped. A Viking Cruises ship travelling off the coast of the Netherlands was badly damaged after it collided with an oil tanker. A record 26 Irish tourism companies, including 13 first-timers, will travel under Tourism Ireland to China on May 6-10 for workshops and networking events in Guangzhou, Chengdu, Shanghai and Beijing. Participating companies include: Andras Hotel Group, Ashford Castle, Brown Thomas Dublin, Byrne & O’Hanlon, Carton House, Castlemartyr Resort, Causey Farm, CIE Tours International, Culture & Heritage Tours Ireland, EG Travel Ireland, Giant’s Causeway, Griffin Group, InterContinental Dublin, Kildare Village, Kylemore Abbey, McKeever Hotel Group, Powerscourt Estate, Rachel Sunshine International, Rural Adventure Tours, The Savoy Hotel Limerick, Só Hotels, Stena Line, Strand Hotel Limerick, Titanic Belfast, Wiiya International and Zatino Travel. Picture shows Alison Johnston of Kildare Village; David Boyce of Tourism Ireland; and Olga Wang of the Chinese Embassy in Ireland publicising the mission. Niall Gibbons updated Tourism Ireland’s Central Marketing Partnership Group meeting on the current season. Watch here. County Kildare Chamber was named Chamber of the year at the Chambers Ireland annual chamber awards, sponsored by Zurich. Event of the year was Waterford chamber’s toys4engineers conference & expo, most innovative project was Northern Ireland chamber’s learn grow excel business support initiative, most successful policy campaign was Cork chamber & Limerick chamber’s gearing up for the M20 Cork – Limerick motorway, best local authority collaboration was south Dublin chamber’s sustainable business partnership programme with South Dublin county council, South Dublin LEO & South Dublin chamber and best chamber marketing campaign was Mullingar chamber’s Winterfest Mullingar 2018. 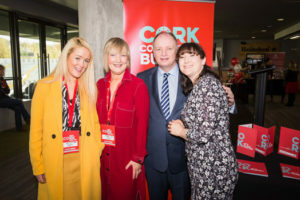 Cork tourism held its annual Keep Cork Meeting event, and said it is targeting agriculture, food, space, neonatal, and maritime-themed conferences, aiming to grow the sector by 8pc to €14m this year. Marissa Mills and Margaret Lynch, Poppulo, Seamus Heaney, Pure Cork, and Lynda Reilly, Failte Ireland, are pictured at the expo for hospitality and tourism operators in the Cork region hosted by Cork Convention Bureau at Páirc Uí Chaoimh. See more pictures here or connect to the album on Facebook. Picture shows Michael Ring with Mayor of Clare Michael Begley, Ministers Pat Breen and Andrew Doyle, and Pat Dowling, Chief Executive of Clare County Council. At the back are Ailish Connolly and Liz Greehy, Kilbaha Gallery, Breda McNamara, Cnoc na Gaoithe cultural centre in Tulla, Teresa Roche, Kylemore Farmhouse Cheese, and Richard Walsh, Murroe Town Park Project, at the #Rural Opportunity event in Saint Patrick’s Hall, Corofin, Co Clare where rural startups were encouraged to find out about supports available to create jobs in the tourism and cultural areas. 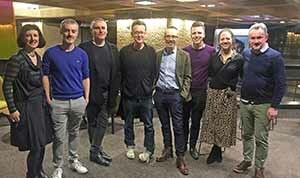 Tourism Ireland briefed London based cultural and lifestyle journalists on the Galway International Arts Festival and Galway 2020 at the opening night of Rooms, the interactive stage performance by Enda Walsh at the Barbican. Picture shows Sinéad McPhilips of Galway International Arts Festival; John O’Ceallaigh of the Daily Telegraph, Paul Fahy of Galway International Arts Festival, playwright Enda Walsh, Coman Kenny of Tourism Ireland; Ben Kelly and Lucy McInerney, of the London Independent; and John Crumlish of Galway International Arts Festival. Game of Thrones touring Exhibition will open to the public at the Titanic Exhibition Centre Belfast on Thursday April 11th, featuring two new sets, Winterfell Crypt and Dragon Skull Pit,, costumes, props and settings from all seven seasons, ahead of the season eight launch. Preview of the exhibition can be seen here. Newbridge House and Farm in Donabate (“Ireland’s only intact Georgian mansion and estate”) launched its immersive ‘House and Farm’ experience under the management of Shannon Heritage, in partnership with Fingal County Council, bringing its unique upstairs-downstairs story to life and a 30 acre on-site traditional working farm with animals. The house has also been the filming location for movies including The Spy Who Came in from the Cold and the Oscar award-winning Barry Lyndon. Full story here. 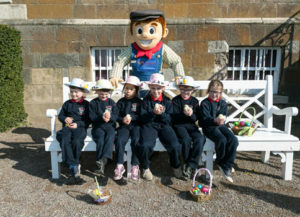 Children from Dunsany National School are pictured with Farmer Joe and new-born chicks at the launch. See more pictures here or connect to the album on Facebook. Presenters from six American radio stations were hosted by Tourism Ireland and Fáilte Ireland, visiting the Book of Kells, the Burren, Kate’s Cottage in The Claddagh, Westport House, Slieve League and the Glencolmcille Folk Village Museum. They are pictured with Tony Kirby, Heart of Burren Walks and tour guide Barbara Hunter. Wicklow Mountains Tour won the Essential Gray Line Award in the Gray Line Product Awards for 2018, ahead of 150 destinations worldwide. The Connacht Battle for the Paddle stand up paddleboarding event takes place Easter weekend, run by Harbour SUP and Sail in Enniscrone and Ballina. Tourism Ireland are collaborating with magazine publishers Hearst Media in three new videos for the online versions of Esquire, Elle and Town & Country. Westport House will host the 7th annual Grainne Ale Craft Beer Festival (love the name) in the beer garden on Saturday and Sunday May 4-5. 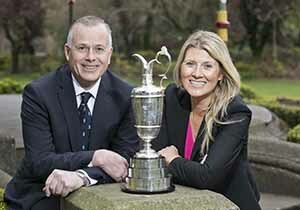 Tourism Ireland launched its Home of Champions golf campaign in the United States with a 30-second ad which will air on NBC Golf Channel with messages about golf in Ireland online on golfchannel.com. See Tourism Ireland’s new TV ad here. INSIGHT VACATIONS OFFERS: The Jordan Experience with Insight Vacations., 7 Days – Visiting: Jordan. Price NOW: from €2,699 per person sharing, including flights, transfers, and 7 nights accommodation in central locations, 11 included experiences, 6 breakfasts, 1 lunches and 4 dinners. Dead Sea extension available. Travel – 7th August 2019. For more information log onto www.insightvacations.com or call 01 775 3803. SUNWAY OFFERS: Sunway Escorted Tours: ‘Best of Switzerland’, from €2,299pp. Departs 25th May 2019. Price includes flights ex Dublin, 20kg bag per person, taxes, 9 nights twin share 4* hotels, some meals and tours as per itinerary. Price includes late reduction of €344 per person which is subject to availability and change. Sunway River Cruise: 5* River Cruise ‘Riches of the Mekong’ fly to Siem Reap and return from Ho Chi Minh. Price from €2989pp. Departs Dublin 23rd August. Includes flight ex Dublin, return transfers, spend 2 nights pre cruise at the 5* Sofitel Hotel in Siem Reap on a bed and breakfast basis and then spend 7 nights on aboard the AmaDara twin share balcony stateroom, full board unlimited wine/beers & daily complimentary excursions. Not included gratuities and port charges of €150pp. Subject to availability and change. Sunway Club Med: Club Med Summer premium All Inclusive Sun holidays, Kamarina, 3T, Sicily. Adults from €895pp and children from €695pp. Departs 18th May 2019. Price includes flights ex Dublin, 20kg bag per person, resort transfer, standard room triple share, all -inclusive for 7 nights. Subject to availability and change. Includes flight ex Dublin, 20kg baggage per person, 17 night’s accommodation on twin share basis, some meals and tours as per itinerary. Subject to availability and change. 2 Nights Traders Hotel Kuala Lumpur – Room Only. 5 Nights Pangkor Laut Island Resort – B&B basis. Pick 2 : Premium Drinks, Speciality Dining, 250 mins Wifi or $50 per Shore Ex Credit from €950pp. Departs 19th May 2019. British Isles Cruise: Crown Princess – 12 nights. 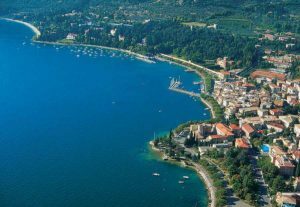 TOPFLIGHT OFFERS: Topflight Lake Garda Offers. RIVA (from Dublin) 4* plus Hotel Kristal Palace, H/B €1199PPS – 21st September. All prices above include return flights from the airport as stated, based on 2 persons sharing, return transfers, accommodation for 7 nights, taxes and Topflight’s in resort service. Call Topflight on 01 240 1700 (ROI) or 028 9752 1168 (NI). See www.topflight.ie or topflightholidays.co.uk. Visit your local travel agent. TUI offers: Dublin to Mauritius, 7 nights all inclusive 3*+ Emeraude Beach Attitude, Trou D’Eau Douce, from €1,799pps, depart June 10. Dublin to Gran Canaria, 7 nights self catering 2* Puerto Plata, Puerto Rico, from €409pps, depart April 25. Dublin to Tenerife, 7 nights self catering 2* Las Piramides Resort, Playa Las Americas, from €339pps, depart April 26. Dublin to Lanzarote, 7 nights self catering 2*+ Tabaiba Apartments, Costa Teguise, 2*+, SC, 7 nights from €389pps, depart April 28. Dublin to Costa Dorada, 7 nights self catering 3*+ Sunclub Apartments, Cap de Salou, from €339pps, depart May 3. Dublin to Algarve, 7 nights self catering 3* Be Smart Terrace, Porches, from €269pps, depart May 20. Cork to Costa Dorada, 7 nights half board 3* Belvedere, Salou, from €449pps, depart May 21. Dublin to Paphos, 7 nights self catering 3* Tabaiba Apartments, Costa Teguise, from €399pps, depart May 22. Shannon to Lanzarote, 7 nights self catering 3*+ Cinco Plazas, Puerto Del Carmen, from €449pps, depart May 23. Dublin to Cancun, 14 nights all inclusive 4*+ Luxury Bahia Principe Akumal, Riviera Maya, from €1,499pps, depart June 24. Dublin to Cancun, 14 nights all inclusive 3* Riu Lupita, Playacar, from €1,219pps, depart June 17. Dublin to Cancun, 14 nights all inclusive 4* RIU Cancun, Cancun, from €1,639pps, depart June 17. Dublin to Bulgaria, 7 nights B&B 3* Lira Hotel, Sunny Beach, from €329pps, depart June 3. Dublin to Kos, 7 nights B&B 2*+ Hotel Bahamas, Kos town, from €429pps, depart June 15. Dublin to Crete, 7 nights self catering 2* Stefania, Stalis, from €459pps, depart June 16. Shannon to Lanzarote, 7 nights all inclusive 3* Suneoclub El Trebol, Costa Tequise, from €589pps, depart June 13. Cork to Majorca, 7 nights all inclusive 3* Hotel Belvedere, San Augustin, from €599pps, depart June 8. Ireland West to Majorca, 7 nights half board 3* More Hotel, Alcudia, from €499pps, depart June 27. Dublin to Dominican Republic, 14 nights all inclusive 3* Caribe Club Princess, Bavaro, from €1,909pps, depart June 18. Dublin to Majorca, 7-night all inclusive cruise ‘Treasures of the Mediterranean’, inside cabin, from €839pps, depart May 14. https://www.tuiholidays.ie. Call 1850 45 35 45 or visit a TUIStore / travel agent. Price NOW: €2,869 per person sharing, including flights, 7-night cruise in a riverview stateroom onboard the majestic S.S. Antoinette, airport transfers on arrival and departure days, all meals onboard, unlimited beverages onboard, 6 days of excursions, all gratuities and more. Travel – 14th July 2019. TRAVEL Extra’s Sunday Supplement: Life after A350, FOUR of Aer Lingus 350s to go to Iberia but what about the other five? TRAVEL Extra’s Sunday Supplement: TAP turns on new route with free Lisbon stopovers for connecting fights from Dublin TRAVEL Extra’s Sunday Supplement: Pier pressure, is Dublin Port willing to reprieve its cap on cruise ships?